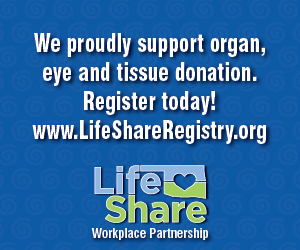 The Workplace Partnership for Life (WPFL) is a national initiative, created in 2001, that unites the U.S. Department of Health and Human Services (HHS) with the organ and tissue donation community and businesses, organizations and associations to spread the word about the importance of organ, eye and tissue donation. The purpose of the program is to encourage the public to register as donors. Who can participate in the Workplace Partnership for Life program? LifeShare of Oklahoma encourages all Oklahoma based companies and associations and academic, volunteer, philanthropic and community-focused organizations to consider participating in the Workplace Partnership for Life program. What Do Workplace Partners Do? Workplace Partners make a commitment to foster donation education and create opportunities for individuals within their organization or community to sign-up to save lives through organ and tissue donation. LifeShare of Oklahoma will work closely with your organization to develop a specific plan tailored to your organizations donation goals. How does my organization partner with LifeShare? If you are interested in becoming a Workplace Partner, please register your organization now!